Is the weekend really already over? It was so good that it makes it hard to believe that it’s over. One of the best parts of the weekend was meeting Stacey’s mom, Marsha! She was in town this weekend and we did a little Houston Yarn Crawl of sorts. It was another one of those instances that happen in the blog world that you don’t feel like you "just met" someone, I felt like we went way back. The only picture I have of us is with my new camera phone, so the quality and blurriness is pretty bad, but I’m showing it anyway because it’s what I have! 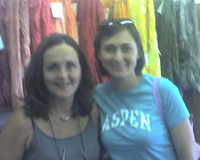 Here we are in Yarntopia in front of the wall of Malabrigo. We had a really good time, hitting Yarns 2 Ewe and Yarntopia. 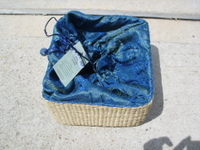 At Yarns 2 Ewe, Marsha gifted me with a a beautiful Lantern Moon basket. It’s so pretty that I’ve been having a hard time deciding where I want to keep it. This picture does not do the fabric justice. Oh, and I got the new Interweave, too. 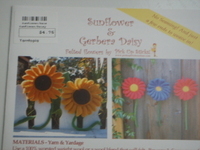 Then, at Yarntopia (very cute store, by the way), I found the pattern for these flowers. I’ve already knit one up and will show it to you later. 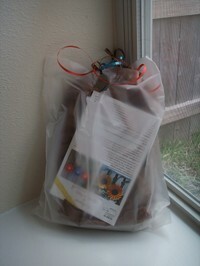 I thought they were a great addition to my craft room and would be good for gifting, too. I walked out of the store with the pattern and the green and yellow for stems and centers. I have plenty of feltable wool oddballs for the outsides of the flowers. It’s the little things that impress me, I love the way they wrap up their packages with tissue paper and ribbons. The yarn was great, but the company was better. Stacey, thanks for letting me borrow your mom for the day and Marsha, thanks for such a fabulous day! Sarah-thanks for taking care of Stacey’s mom. I don’t even know anyone in the family personally, but am praying for all of them and especially Dad. Found your blog via Stacey.